Going through some photos my maternal grandmother took. Most of them in the 1920s and 30s, though a small handful of them from the early 40s. I came across one without any people in it. It looks like a humorous billboard that caught her eye, though I have no idea where it was located. I say I have no idea where it was...however, "seabee" is a term for the 'construction battalions' of the US Navy. Rats is a term often associated with members of the Army. And SNAFU is a military term. So I wouldn't be surprised if this were at a military base of some sort. 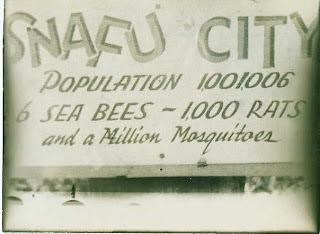 However, this would date the photo to the 1940s, as the 'sea bee' term was coined for WWII, and it would probably be the most recent photo in the box. I don't know if there was another meaning for the term before then. My suspicion is that this isn't an example of 'antedating'.